A recent report published by Infinium Global Research on automotive sensors market provides in-depth analysis of segments and sub-segments in the global as well as regional automotive sensors market. The study also highlights the impact of drivers, restraints and macro indicators on the global and regional automotive sensors market over the short term as well as long term. The report is a comprehensive presentation of trends, forecast and dollar values of global automotive sensors market. According to the report the global automotive sensors market is projected to grow at a CAGR of 8% over the forecast period of 2018-2024. Automotive sensors are used to monitor, control and detect data for better performance, safety, comfort and convenience related to vehicles. There are various types of sensors are used in the automotive sectors which include the temperature sensor, knock sensor, the acceleration sensor, air flow sensor, parking sensor, MEMS sensor, motion sensor, gas sensor, pressure sensor. These automobile sensors have several applications such as brake master cylinder position detection, minimize fuel consumption, all gear detection for the manual transmission to support start and stop function and prevention windscreen fogging, and energy management. The automotive industries are constantly increasing the use of the electronic system to improve passenger comfort and improve vehicle performance, which has a positive impact on the automotive sensors market. According to the world health organization, over 3400 people die on the world's roads every day and tens of millions of people are injured or disabled every year. Strict government rules and regulation related to passenger safety and rapidly growing adoption of advanced driver assistance system (ADAS) in new vehicles is anticipated to boost the growth of Automotive Sensors Market. The various types of sensors are used in the ADAS system are adaptive cruise control (ACC), blind spot detection, traffic sign recognition and, lane departure in the vehicle which facilitates the extensive use of the automotive sensor. However, the pricing pressure among key players may hamper the growth of the automotive sensors market. Furthermore, raising awareness related to the new automotive sensor such as cameras, radar, and Lidar, Innovation of new products and up gradation of existing sensors to meet customers’ requirements are anticipated to create growth opportunities for the Automotive Sensors Market. 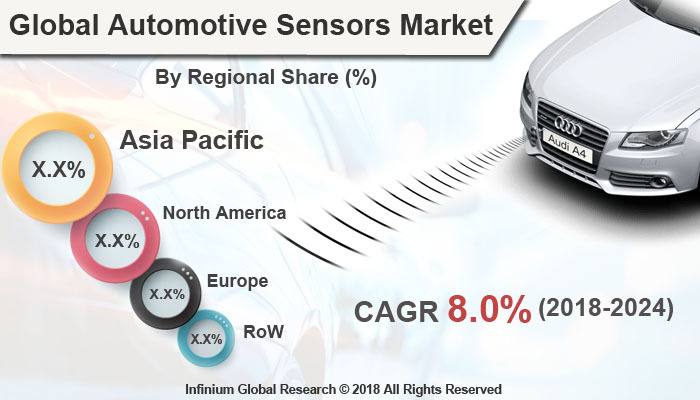 Among the Geographies, Asia Pacific holds maximum share in Automotive Sensors Market owing to the growing automotive industry and high demand for passenger cars. Growing demand for safer and comfortable vehicles and the rise in purchasing power parity are some of the factors escalating the growth of the market in the Asia Pacific region. The developing countries such as China and India have significant growth potential for the Automotive Sensors Market. The automobile industry in China has been the largest in the world and is expected to be lead worldwide over the forecast period. Growing adoption of advanced driver assistance system (ADAS) in developed counties such as U.S., Germany, and the U.K. is boosting the growth of the automotive sensors market. The report on global automotive sensors market covers segments such as type and application. On the basis of the type, the global automotive sensors market is categorized into temperature, pressure, speed, level/position, magnetic, gas and inertia. On the basis of application, the global automotive sensors market is categorized into powertrain, body electronics, vehicle security systems, and telematics. The report provides profiles of the companies in the global automotive sensors market such as Analog Devices Inc., NXP Semiconductors, Maxim Integrated, CTS Corporation, Aptiv, Sensata Technologies Inc, Texas Instruments Incorporated, Robert Bosch GmbH, Infineon Technologies AG and DENSO CORPORATION. The report provides deep insights into demand forecasts, market trends, and micro and macro indicators. In addition, this report provides insights into the factors that are driving and restraining the global automotive sensors market. Moreover, IGR-Growth Matrix analysis given in the report brings an insight into the investment areas that existing or new market players can consider. The report provides insights into the market using analytical tools such as Porter's five forces analysis and DRO analysis of automotive sensors market. Moreover, the study highlights current market trends and provides forecast from 2016-2024. We also have highlighted future trends in the automotive sensors market that will impact the demand during the forecast period. Moreover, the competitive analysis given in each regional market brings an insight into the market share of the leading players. This report will help manufacturers, suppliers, and distributors of the automotive sensors market to understand the present and future trends in this market and formulate their strategies accordingly.